The Age of Adz is not only Stevens getting rid of his old "conceptually cute" nature, but it is also him finally living up to his musical potential. The Age of Adz is the anti "50 state project": Stevens makes an album that is based on instrumental chaos and uncertainty instead of making albums full of similar sounding songs that are based off of a sense of entitled complacency, Stevens writes song that try to define himself instead of writing songs that shamelessly try to define random states and random landmarks, and Stevens is finally more focused on making music instead of just making an impression. In the five year span between Illinoise and The Age of Adz, Stevens mastered just about every instrument, lyrical concept, vocal styling, and genre that he would want to present in his ultimate album. This means that even though The Age of Adz may be an album that was supposed to be based on discombobulated and borderline apocalyptic themes, even the quirkiness instruments and notes are so well-executed and produced that it ends up sounding absolutely beautiful and even groundbreaking. This also means that even though the lyrics on The Age of Adz may be hyperbolic in their bleakness, they are believable because they are so well-written and sang with such emotion. 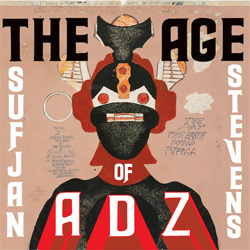 Every lyric on every song on The Age of Adz somehow matches perfectly with every weird instrument that Sufjan is playing, every weird instrument somehow matches his vocals, and every chaotic atmosphere Sufjan conjures up just makes the listener feel like they are floating in the middle of the biggest ocean in the world. The Age of Adz works because Stevens isn't trying to define your world; he is defining his. Our world might just be filled with acoustic guitars, visits to random landmarks, sappy songs about girls we have crushes on, and a long night drive on some abandoned highway. But Stevens world is much more musically interesting: it is based on chaotic atmospheres that are so well-executed that they become soothing, it is based on lyrics that are so selfish and self-effacing that the end up connecting with the listener better than any lyric on Stevens previous works, and they are based on Sufjan potential not the potential of some irrational concept. During the "50 states project," Stevens wanted more than anything for us to relate to the potential of his work. TAOA is Stevens realization that you cannot have people relate to the potential of anything without first freeing yourself to reach your full potential. It is easy to describe all of the great moments in TAOA: the breakdown to "The Age of Adz," the ghostly Ok Computer like background vocals in "Now That I'm Older," the last three minutes of "I Want To Be Well," the vulnerability of "Futile Devices," the opening to "Too Much," the chorus of "I Walked," and the boldness of "Impossible Soul." Even though all of these moments are important they miss the overall point: The Age of Adz is where Sufjan Stevens decided to "Get Real and Get Right," to define himself before trying to define other people, and to reach his full musical potential. And by reaching his full potential Stevens might not have musically defined a couple of people in a couple of states; he may have defined an entire generation.